French toast is one of those breakfast dishes that I thoroughly enjoy. I reminds me so much of my childhood. My mom would always make me french toast and to this day, she still makes it the best! Since we are in the midst of apple season here at Russo’s, I thought I would put a little fall spin on this classic breakfast dish. 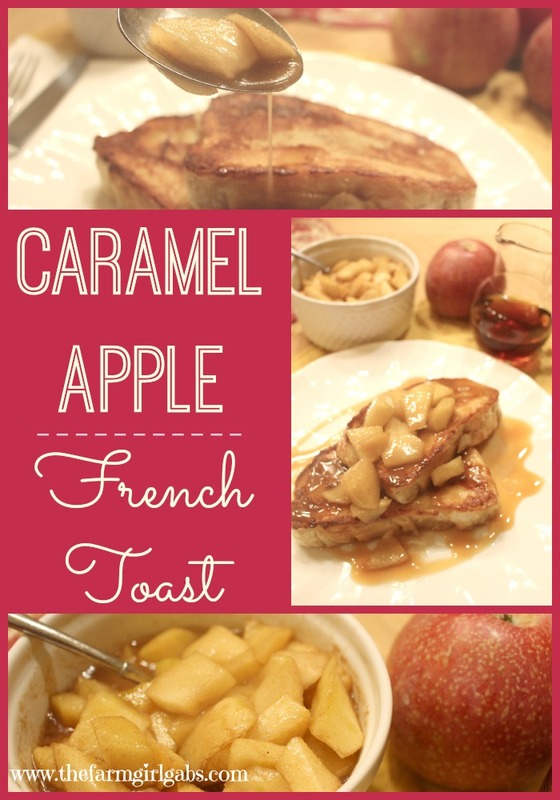 How about Caramel Apple French Toast? Anyone? Crisp apples, sautéed in butter and brown sugar combine to make the perfect topping for this dish. It’s perfect for any time of the day too! You know how I love breakfast for dinner here at my house. Ok, now that your mouth is watering, here’s how I made this delightful breakfast! I begin with a nice loaf of Italian bread (because I like Italian bread). You can use any kind of bread you like. Cinnamon and challah breads are great to use too. I then mix together eggs, half and half, cinnamon, vanilla and a pinch of salt. Pour into a casserole dish and soak each piece in the egg mixture. Cook French Toast on a medium-hi heat griddle pan. Don’t forget to spray bottom of pan with non-stick cooking spray. I also like to add a couple of tablespoons of butter so each piece gets a nice buttery taste. Flip over when each side is light brown and crispy. While the French Toast is cooking, I add diced apples, brown sugar, cinnamon and butter to a saucepan and cook until tender. The brown sugar will become nice and caramelized. It is so yummy! This is the perfect breakfast dish to make for family and friends. It’s great to eat any time of the day. If you’re a lover of “breakfast for dinner” like me, you can even serve it for a hearty dinner meal as well. The caramel apple topping would also be perfect on pancakes too. I love the perfect fall spin on this classic dish. I hope you do too. What’s is your favorite breakfast? 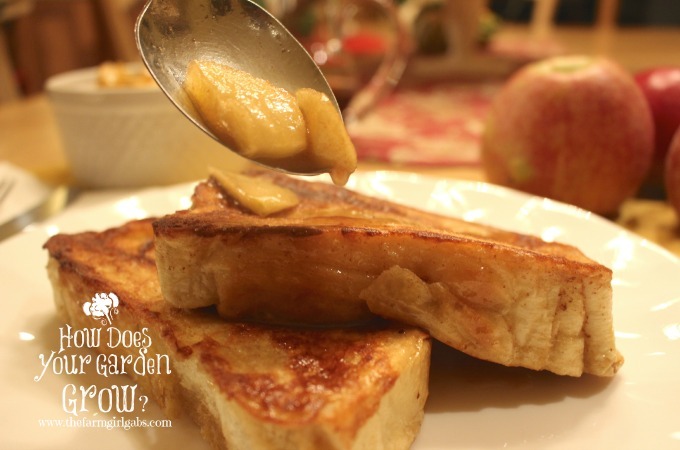 Melissa Russo's Caramel Apple French Toast is a fall spin on a classic French Toast dish. A great dish for breakfast, brunch or dinner. To Make Caramel Topping, peel and dice two apples. Add apples, brown sugar, butter and cinnamon to medium saucepan and cook over medium heat until tender and caramelized. Heat large griddle pan on medium heat. Coat with non-stick cooking spray and 3 tablespoons of butter. In mixing bowl, crack eggs. Add half and half, vanilla and pinch of salt. Whisk together until well combined Set aside. Slice bread 1/2 inch thick. Dip each slice of bread in egg mixture and add to griddle pan. Cook each side until light brown and crispy. To plate: Add 2 slices of cooked French Toast to a dish. Top with Caramel Apple mixture. Drizzle with caramel ice cream topping and maple syrup. Italian bread works well with this recipe but feel free to use any type of hearty bread you like. 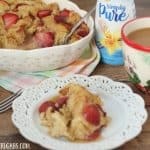 Looking for more great Breakfast recipes? Be sure to follow my Pinterest Breakfast board for some great ideas to start your day! Follow Melissa Russo / How Does Your Garden Grow?’s board Breakfast Ideas on Pinterest. This looks really good! I know what I am going to be making the family for breakfast this weekend! Yum, I love french toast. Pinned this. 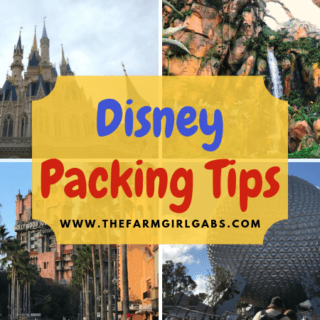 visiting from the Learn to Blog group! This sounds amazing. And it can even be done gluten-free! Looks amazing. May try this week. This looks so good, and I want to visit your gardening pages too! I love French Toast! Totally have to try this version! Yummy! French toast is my favorite breakfast food. Adding cinnamon caramel apples is amazing!! Happy SITS Day! I still have a lot of apples from our apple picking trip. This recipe sounds delicious and a good way to use them. I’m not usually a french toast fan but anything is good with baked apples on top! Yum!